I reckon a fallen leaf can tell a story. 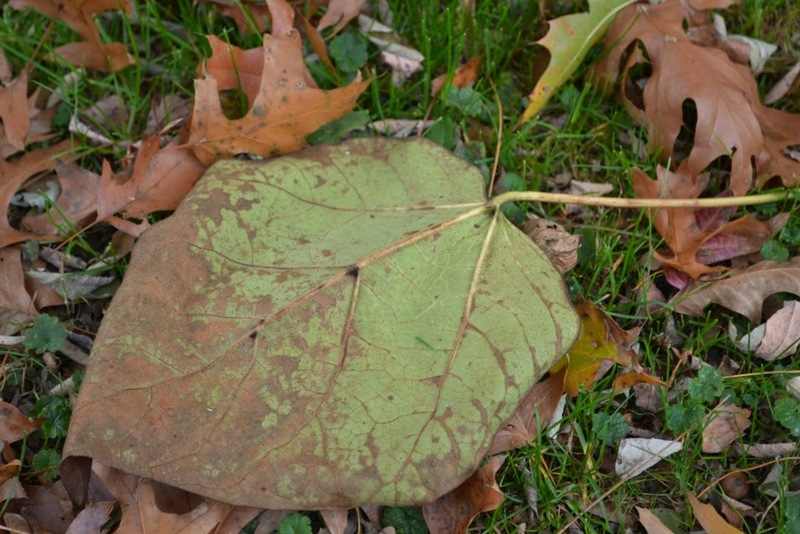 When I saw a Catalpa leaf that had fallen in our yard, I was reminded of a phenomenon that happens during the summer. Can you see what I saw? Can you picture what happened on this leaf last summer? See those dark spots along the midrib or main veins of the leaf? Those spots are the extrafloral nectaries on the catalpa leaf. During the summer those nectaries attract quite a variety of insects. I can see them now.... Ladybugs, little iridescent bees, ants, yellow jackets, and so on. Why does a tree attract these insects to its leaves? Well, many of them are predators and while they are hanging around enjoying the nectar on the leaf they might encounter some caterpillars or other insects that are feeding on the leaves. I went into much greater detail in an earlier post about the extrafloral nectaries on catalpa leaves. I reckon that fallen leaf, with its outstanding spots, reminds me of how lively a place it was a few weeks ago. BTY, last fall I wrote a post about another fallen leaf... an aspen leaf with a cute little stem gall.